Valerie: Today is Tuesday, 3rd of October 2017 and we are at Moss Vale, Australia. And with great love in our hearts and respect we are calling upon Cosmic Sai Baba to make his presence among us. And we welcome Him with great love, great respect and joy. 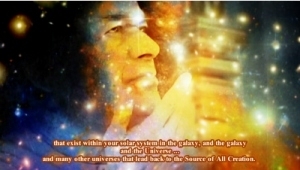 ❝It is I Cosmic Sai Baba, and I am very pleased to be here. I am among friends I know and no one is afraid. And that is good for there is no reason to ever be afraid. As Valerie has said, there is no reason to ever be afraid of anything that comes from spirit because it cannot come and harm the flesh of a human body – however, you need to be aware all the time that there are mischievous problems caused by spirit that are malevolent- I have to say this. Not necessarily the way you thought it should have been but it is help. And this is the point I make direct coming from a benevolent point of view – coming from all is that they need to ask first – because the Universal Law does not allow us to come in and just take over. You have choice – humans have choice … and what they choose in their lives is what they choose in their experience from that point. So there is nothing to worry about at all – if you choose to call upon a Benevolent spirit/energy – God – Angelic Beings – or someone that you can trust that you know in other worlds – this I would encourage you to call upon and you will be responded to straight away. I have not come to speak for too long today – I just want you to be aware that there are energies – other worlds – other beings I have talked about before – but there is a need for you to use discernment at all times. So if you can connect to your heart – because your heart has a consciousness that by-passes the brain – it connects to the consciousness that is within your heart; and you will have that feeling of calm within you – it is in all of you – It is of the Divine Light that exists within you and the Universe. So I am not going to speak much longer today for there is another that is meant to speak. So thank you my children, thank you. I love you all. You are all Loved. All humanity is loved. God is the Creator of man – it is man who has created God. But you need to question that? It is the 3rd October, it is Tuesday and we have been asked by Cosmic Sai Baba to receive Another who wishes to speak. I am not too sure who it is – so if we can just focus with love on this Being it will make its appearance. “I am Val, and I speak from Andromeda – Valerie knows of me – I have already told her that I am her future self. I have actually appeared to her beside her bed – and she got a start – but I was not going to harm her at all. I just wanted her to know that I really do exist. And there are others who exist from the humanity upon this Earth that has gone on to evolve and to be part of the Galaxy Andromeda – which will eventually embrace your Galaxy, the Milky Way. But that is a long story – I only want to share the fact that those that have come in the 144,000 to help the humans upon this Earth in this year 2017 and before – they have come to help and assist the creation of humanity – they have come to assist with the Creation of the Planet itself. And they have come always to help and assist – but it has always been the Law of Free Will and so the humans have choice. Unfortunately – as Cosmic Sai Baba has already said – there have been forces over the evolution of this planet the Milky Way with Malevolent energies that were not part of the GREAT PLAN. However, they were embraced and they were also asked to assist and to change for they could take over the planet for it was not theirs to take. This Planet Earth, the Milky Way has been created by the Angelic Realms in Andromeda to be as what has been called the Garden of Eden – it is the place in the Milky Way that is a very dark corner. And is a place to bring a civilisation that were coming from the heart and love and help to bring Divine Energy of Light into this corner of the Milky Way. That is the Great Plan – but there were many things that had to change and so that is the mission of the Planet Earth and much knowledge has been given about that. I want to assure you that the people who come from Andromeda are only of Good – they are benevolent Beings – it hasn’t been all that long – that we have been able to connect telepathically to all of the Earth people – but we are becoming closer now and so the door is open now to all who want to connect. As I said, I can assure you we only come to assist. There are lives here on other planets in the Galaxy of Andromeda – so there are different civilisations in Andromeda – but they are all coming from a certain level of a frequency of a dimension or a world that is only for the good of all. And coming directly from the consciousness of God in the Highest Order. They would never think of raising a weapon to sort out a problem. They Only want to assist – they respect all even though they know that there are many on this planet – the Milky Way, that has lost the way. They do not change. Man has invented that. It is not God that judges – and if anything it is man themselves who judge themselves. I would like people to think about that. Think of things as Life as an opportunity to learn to understand, to grow – and never judge – but to realise that perhaps sometimes mistakes are made – but they can be corrected. And with the assistance – of the Angelic Beings that exist – all you have to do is call them to help you. Or any other Form of Benevolent Beings that you know that come from the Source of All Creation; that is all you have to do. There is never any reason to be afraid – You can call upon Cosmic Sai Baba – He is still around in your area of your Galaxy. He has no limit, of course, and He can come and go whenever he chooses. As many of us that are in the future thousands of years ahead of where you are now in your Galaxy the Milky Way. The Angelic Realms have no limit. They can change their form – they can manifest whatever they want or whatever they need. It is rather fun actually – you could call us, when we come from that place, Creators – or co-Creators with The Source of All Creator – the Creation of All. I would like you to think about that – and know the reality of that. There were and are the 144,000 that have come to assist – The Healers, The Light Workers, The Peacemakers – all these people have come to assist and they live now in an earth body but there is nothing to be afraid of – you will recognise them. And you will know from their gentleness and their kindness and their willingness to always want to assist. You may be one of them and maybe you have lost the way a little because you have allowed yourselves to be influenced by negativity – negativity energy or negative thought forms. All you have to do is to say “No longer do I want to be influenced by that energy – I want only to be influenced by the Light of God.” That could sound like a religious calling – but it is not really – it is the reality of who you are. You are in an earth body on this Galaxy the Milky Way – this Planet Earth – you are a human. You are a Light Man. You have been gifted with a Soul that helps to carry and hold Divine Energy in you always. Because it is so gentle it can sometimes be lost – well not lost – but put in a place that you do not seem able to connect too easily within you. And all you need do is to calm yourself – hold your heart, because that is the seat of your Soul and connect to that energy. You will feel a lot stronger; and (more) confident and strong and able to handle anything that life puts if front of you. Please, I do not want to sound like I am preaching – far from that. I am just hoping I can help you to understand who you really are. You are – a consciousness that exists without limit. It is not the brain, although the brain is influenced by the thoughts that you have and the choices that you make. But inspiration and ideas don’t come from your brain; they come from your Soul. The consciousness of your Soul which exists – whether you are in an earth body or not. So please think about this – please think about this. For we know, because you are born of the Light of the Creator – you only want Peace – that is inborn in you – in everybody on this Earth – and that is what will make you happy. I falter sometimes (in transmission) because where we are in Andromeda we communicate telepathically only – so working from Val through to Valerie – it has to come through her voice box – that is why I am faltering a little. But I will be doing this more often now and so I hope you will bear with me in this transmission. In actual fact, we would like her to speak our language that we speak in Lyra – or Lya where we are at this time in Andromeda. So please accept my entrance here and I hope you will be willing to listen – you don’t have to be forced in any way – you can decide for yourself. Thank you, thank you, thank you for making my visit feel welcome. This morning I was reminded of when Sai Baba first gave me the green ring – he called me for an interview – and then gently turned to me and said “What is your name Val?” and everyone laughed.